Users can reach mobile news content through a variety of channels, including arriving at a given article by way of a link that shows up in their Facebook feed, via a Google search or clicking a bookmarked address. As the Center found in earlier research about desktop news behavior, it’s possible that for long-form content on cellphones, some pathways tend to lead to greater or lesser engaged time with an article. 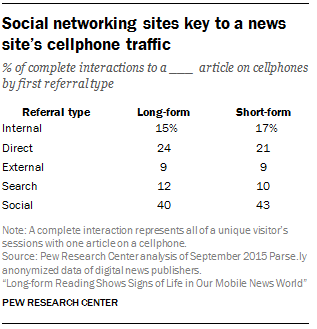 For long-form news articles in particular, certain pathways on the phone yield greater engaged time than others. Those who arrive at a long-form article by following a link from another page within the same website – such as a homepage or a suggested link from another article – result in the greatest amount of time spent with the article, an average of 148 seconds. 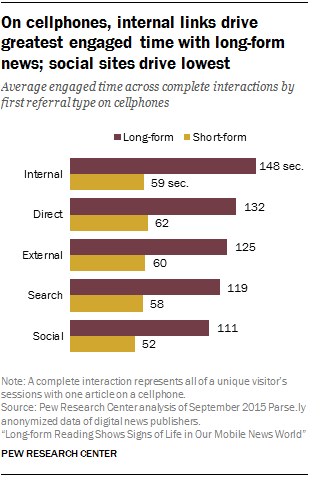 Those who follow a direct referral display the next greatest engaged time at 132 seconds. That is followed by an average of 125 seconds for those who came from a link to the article from another website (not including search or social sites), and 119 seconds for those coming from search engines. At the bottom are those coming from a social networking site, averaging 111 seconds per story – 25% shorter than those coming from an internal link. There is less variation across pathways for short-form articles, with internal, direct, external, and search all averaging between 58 and 62 seconds. But, similar to long-form, visitors who first land on a news story from a social media site spend the least amount of total time with the article – an average of 52 seconds. As was true for the analysis of engagement by time of day, the pathways that lead to users spending the most time with news articles are not always in sync with the pathways which drive the most overall traffic to news. For example, social media referrals generate the greatest number of visitors to a given news article – 40% for long-form and 43% for short-form – even though the analysis suggests those readers then spend the least time engaging with the content. That is followed by users arriving directly: 24% of visitors’ complete interactions to long-form and 21% of short-form. Those arriving from another place in the same domain account for 15% of cellphone visitors’ complete interactions to long-form articles and 17% to short-form. For both long and short content, the portion of visitors’ complete interactions that started from search and external websites range from 9% to 12%. When it comes to social media, there are some noteworthy differences in the way people coming from each of the two larger social networking sites – Facebook and Twitter – interact with news. While Facebook drives more traffic to news articles in this study, Twitter tends to bring in people who spend more time with the content. Facebook, by far, sends a greater volume of readers to both short-form and long-form news. Overall, about eight-in-ten user complete interactions with a news article via a social networking site come from Facebook (82% long-form and 84% short-form), while a much smaller portion come from Twitter (16% long-form and 14% short-form). 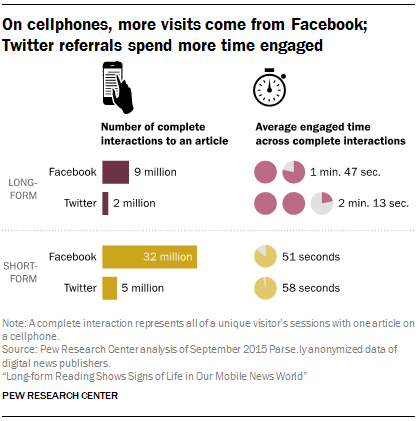 But, when it comes to time spent with the article, Twitter referrals outpace Facebook. For longer content, users that arrive from Facebook spend an average of 107 seconds, compared with 133 seconds when they come from Twitter, a 24% difference. In shorter content, the same pattern emerges. Those arriving from Twitter spend more time with that content (58 seconds) compared with those coming from Facebook (51 seconds). The remaining social networking sites account for only a small fraction of an article’s traffic. For both long-form and short-form content, LinkedIn, Google Plus, StumbleUpon, Reddit, Tumblr and Pinterest combined traffic yields 2% of the total social referrals. Despite the low traffic coming from these social networking sites, some send users who spend relatively high levels of engaged time. Referrals to long-form news from Tumblr, for example, yield an average of 150 seconds, surpassing both Facebook and Twitter. 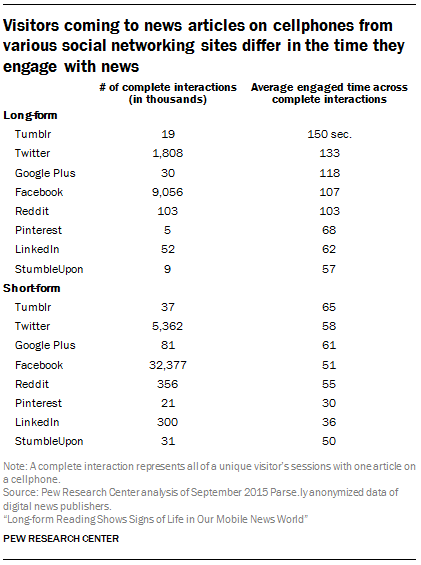 Google Plus, on the other hand, falls in between Facebook and Twitter at 118 seconds of engaged time on average.